Adults are 61 cm long and weigh 375 g. They have a slim black bill and long black legs with yellow feet. The area of the upper bill, in front of the eyes, is yellow but turns red during the breeding seaon. In breeding season, adults have recurved plumes on the back making shaggy plumes. 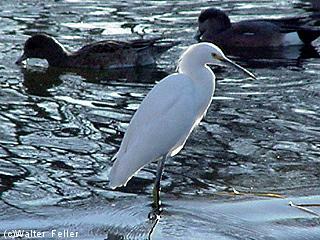 These birds stalk their prey in shallow water, often running or shuffling their feet, flushing prey into view. Snowy egrets may also stand still and wait to ambush prey. They also hunt for insects stirred up by domestic animals in open fields. They eat fish, crustaceans, and insects.